Nico studied his face — his sea green eyes, his grin, his ruffled black hair. 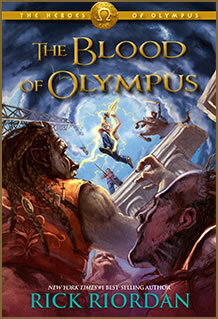 Somehow Percy Jackson seemed like a regular guy now, not a mythical figure. Not someone to idolize or crush on. Annabeth’s gray eyes started to sparkle. She gave Nico a sideways smile. She raised her hand for a high five. Nico obliged. Then he walked back across the green, where Will Solace [who, as son of Apollo, the god of medicine and healing, serves as the camp’s medic. Riordan strongly hints that he is gay and that he and Nico are becoming an item] was waiting. The Story: Finished Reyes’ short story BUHAY (LIFE). Now I get it. Ida, the not-very-well-fed 7-year-old girl, trips, and, after the package of noodles she is carrying bursts on the street, the noodles slip (? — nagsampiran — could not find a translation for that word) into the muck of the canal. This is a sad event, of course, but it is also conspicuously not a huge tragedy, not the least because Ida has already eaten half the noodles. The more trivial and less trivial events of Ida’s day are what the story relates directly, but what’s hidden behind these events is a tragedy the outlines of which gradually emerges for the reader, though not for Ida. Ida’s mother, widowed and left impoverished by the extra-judicial killing of her husband by the police, has just resorted to prostitution in order to buy food for Ida and her young brother, Obet, and to buy medicine for Obet, who has fallen sick with a fever. Reyes shows, but does not tell, that, in spite of the medicine she went to desperate extremes to buy, the mother does not think Obet is going to live. Half of Ida’s noodles do her no good; probably the medicine will not do Obet enough good. The general structure of the story: BUHAY starts with Ida making these strange movements…then the reader gradually (more slowly for the reader who is just learning Tagalog) realizes she is playing some version of Hide And Seek with Emy, who suddenly emerges from her hiding place. Something overt, and something hidden which emerges. Something overt — Ida knows her mother has just bought a beautiful red dress — something hidden that emerges (though not for Ida) — her mother has just resorted to prostitution. Something overt — the events of a 7-year-old’s day; something hidden that partially comes into Ida’s view but more fully into the reader’s view — the mother’s desperation. I doubt very much I am saying anything original by pointing out that presenting things this way (not stating the important things directly, but letting them emerge for the reader from the less important, even trivial things) vastly increases the impact of the story. To state something directly is to put it in a category … is to risk wearing away the sharp point of this particular tragedy by rendering it as just one tragedy among countless others. Not stating it directly increases the chances the story will be kasingkulay ng buhay (equally colored as life itself). Aristotle’s Katharsis, I suppose: In one of the Tagalog reviews in GOODREADS of SA AKING PANAHONG, the reviewer noted he started out reading the stories to his mother, but then stopped because she would start sobbing after each one. I am not sure why I am reading these — I start sobbing after each one. The following is my translation of Edgardo Reyes’ short story Isang Balutang Pansit. The version that I am using is available here; the version to be found in his anthology of short stories, Sa Aking Panahon, differs quite a bit from this one. Warning: My Tagalog is shaky. Where I wonder if some other phrasing might better express the author’s intention than what, to my definitely non-expert eyes looks like the literal translation, I put that inside square brackets. I tend to be a bit literal in my translation of naman (principle meaning: in turn; subsidiary meanings: also, too, really, namely) because I haven’t yet lost my fascination with that word and the heavy use of it made in Tagalog. My translation sometimes has a slight bias towards the literal, but sometimes veers slightly away from the original when I think the impact will be greater in English. I’ve often kept the original interjections as a way of showing this is a very different setting. From his position at the door of a small and dirty restaurant he looked inside. His vision, clouded like smoke, was nailed to a glaring sign there: Noodle Special — 40 cents. For a long time Imo stared at the packages of noodles stacked on top of one another inside some glass shelves. How many times he swallowed semi-consciously. The pain in his stomach became more severe. How many days ago was it that he had tasted rice? He could not remember. Usually what he ate was cheap and dry bread. Imo strolled through the door of the restaurant. Just maybe one of the regulars there would be someone he knew who could give him the additional amount needed to enable him to buy one package of noodles. By and by, he was surprised when a boy entering the restaurant at a run accidentally brushed against him. “Hey!” exclaimed Imo. But the boy, continuing inside at a run, paid no attention to him. The Chinese proprietor of the restaurant approached the boy. “One package of noodles is 40 cents,” said the Chinese man with a thick accent. “Isn’t twenty one half, e?” said the boy. “We don’t do halves,” said the Chinese man with his thick accent. And the man turned to face his other customers. The boy’s body was dirty. There were many blackened holes in the t-shirt he was wearing. His hair was shaggy and probably had not been cut for some months. He was probably about ten years old. Imo smiled faintly as he watched the boy. They both had the same problem, he thought to himself. But his smile vanished at once when a little idea flashed in his mind. He looked at the boy again, who in turn was now facing the Chinese man. “I’ve already said we don’t sell halves,” said the Chinese man irritably. Imo hissed at the boy to grab his attention. When the boy looked at him Imo beckoned to him. The boy approached. Imo put his arms around the boy’s shoulders. They went outside a ways in order to not be visible from inside the restaurant. The boy stared squarely at Imo rapidly blinking his eyes. Imo could read from his gaze the meaning: “You are virtually a grown-up, yet you have only 20 cents!” Imo laughed. Instantly, the reason why he was in such a circumstance pressed its way into his mind. It was because he was set firmly on the only dream of his life. He wanted to become a writer. He had written many stories already but not one had yet been published. His parents were angry at him because they thought he should be turning his face to other work. They said such profitless things were only a waste of time. And in order to avoid the reproaches of his parents, he ran away from them. He lived by himself now. His friends were his only aid. “What game of chance?” the boy cut in rather brusquely. “If my 20 cents go to you, you will then buy some noodles,” said Imo. “If on the other hand your 20 cents go to me, I then will be the buyer. Now, we’ll play kara-krus. I throw. Should both our coins turn up heads, your 20 cents are mine. Should both coins turn up tails, my 20 cents go to you. If one coin turns up tails and one heads, the contest will be a draw. You will then throw. The boy gaped. He looked up, seeming to ponder. For a long time he stayed in that form. “All right,” agreed the boy after some moments had passed. Imo squatted. The boy also squatted. They faced one another. “To me and mine the first throw,” said Imo. For a while, the boy hesitated. Then he handed over his 20-cent silver piece. “No cheating, ha?” said the boy. Imo placed the 20-cent silver pieces one on top of the other. He looked up pretending to throw. When the boy’s gaze followed, by the quickness of his fingers [by sleight of hand] he threw both pieces heads facing up. As a matter of fact, the pieces fell heavily like cement. But I have the advantage, Imo thought to himself. The two pieces of silver clinked: both were heads! But the boy picked up the one 20-cent piece. Imo smiled. This boy is cunning, he thought to himself. He rejects the throw when it turned up both heads. But had it turned up both tails, he would have ignored the cheating! No, he would not have contested it! The boy agreed. He threw in turn. The one coin kept flipping over from side to side, then proceeded to stop: tails. But the other coin was still wheeling towards the feet of the boy. He quickly withdrew his feet in order to avoid touching the coin’s wheeling roll. It dropped to the bottom of the gutter and disappeared from their view. The boy picked it up and showed it to him: heads! Imo didn’t say anything. Now the boy in his turn was the cheater. Imo clearly saw the coin facing heads-down in the hand of the boy when he picked it up. But when the boy showed him the coin it was facing heads-up. “You cheated, if truth be told,” said Imo irritably. “You were the one who was cheating first there, eh,” said the boy. The boy didn’t reply. He tossed the two 20-cent silver coins into the air. They bounced on the ground a bit then finally stopped. Both tails! “There, it’s clear now, ha?” Imo said laughingly. You lost. There is nothing you can say. The throw was yours. The boy was silent. He gaped at the silver coins in the palm of his hand like an idiot. He looked as if he wanted to cry. But the boy stayed silent. The boy didn’t move or say anything. Imo saw him rubbing his eyes. Imo shrugged his shoulders. He left the boy, and proceeded to go inside the restaurant. He bought a package of noodles, then went outside to go home to the hut he had erected in the squatters’ neighborhood. It was only a few steps away from the restaurant when it occurred to Imo to look back. The boy was still looking up from the place where he was squatting. He was looking at Imo, gaping. Imo turned around to go. The boy was to his right. To his left in turn was the street heading towards his home. Imo whistled while he walked. He moved his head from side to side. Darkness started to spread. Bright lights were shining in the buildings lined up on both sides of the street. There was a scattering of people walking on the sidewalk. Finally, his stomach would experience having enough, Imo thought. For a long time, he had not been able to eat any noodles cooked in that restaurant. Imo was turning into the narrow alley leading to the addresses of the squatters when he was caught by surprise. All of a sudden, the package of noodles he was holding was snatched from him. Immediately, he turned around to look. He say the boy whom he had defeated earlier in kara-krus running at top speed like a demon. He was carrying the package of noodles! Imo chased after the boy. The chase lasted for a long time. Through how many streets they swerved. The boy got further and further away from him. Imo could not make himself run fast enough even to keep up with the boy’s run. He was embarrassing himself in the eyes of the people who saw them. He saw the boy swerve left around a corner of a tall building. Imo was still following him. But when he in turn swerved left, he found himself completely baffled. The streets were clean there. Nor was anyone walking around. But there wasn’t any boy either! Half-consciously, Imo scratched his neck. He looked around. He searched for where the boy may have swerved, or where he may have hidden himself. He saw in turn nothing. The street did branch off into several paths a little way ahead. But before the boy could have arrived there, Imo would have seen him first. Just as he was about to leave, Imo saw a large wagon stopped by the side of some garbage containers that in turn were not far from him. Maybe the boy is inside the wagon, Imo thought to himself. Imo quietly approached the wagon. But after taking just a few steps, he stopped. The neck of the boy was visible. He was in the wagon. But he was talking with someone. “You, boy…you, boy..[itoy…itoy].” said the boy. “Wake up. Here are some noodles, e…you said that you wanted something to eat. Wake up now. You will get better when you eat these. Boy! Boy! These are the noodles I bought for you. You were just hungry that’s why you got sick. This will heal you; you’ll be as good as new. Wake up now. Wake…” and the boy stopped. “Ahhhhhhhhhhhhhhh!!!!!!!!!!!!!!!!!! the boy cried. He proceeded to weep forcefully. Imo approached. He saw the boy hugging another large boy who was lying inside the wagon in the midst of some dirty paper, iron, cans and what he made out to be some agricultural implements of some kind. The boy lying there was almost nothing but skin and bones. He was probably only 5 years old. His hands were stretched out as if they were dried-out wooden branches. He didn’t move. His eyes were closed. “D…dead…my brother is dead!” cried the boy sobbingly. You, boy!” And he again wept. The package of noodles fell from his hand, landing on a rusty gas can. Imo felt as if his breath did not want to pass through his throat. Completely empty inside, he bent over into the inside of the wagon to reach for the package of noodles, and picked them up. Trying to hide his feelings, he tightened his fist without his knowing it. The flesh of the noodles squeezed out through the spaces of his fingers. UPDATE: 01/01/2014: Added link to the original Tagalog story. UPDATE: 01/08/2012: corrected some typos, attempted a better translation of some words.